Emperor of the Sea is a new Microgaming five reeled game that has multiple options for its active lines. Players can activate 38, 68 or 88 paylines. The game takes players on a great ride with an Asian theme as they travel to the empire of the dragon king as they search for prosperity and fortunes. They will get to claim these riches as their own through the win lines of the game, as well as through the special features and icons that the game has. The game comes with a free spins round, stacked wilds, Rolling Reels and growing wilds. 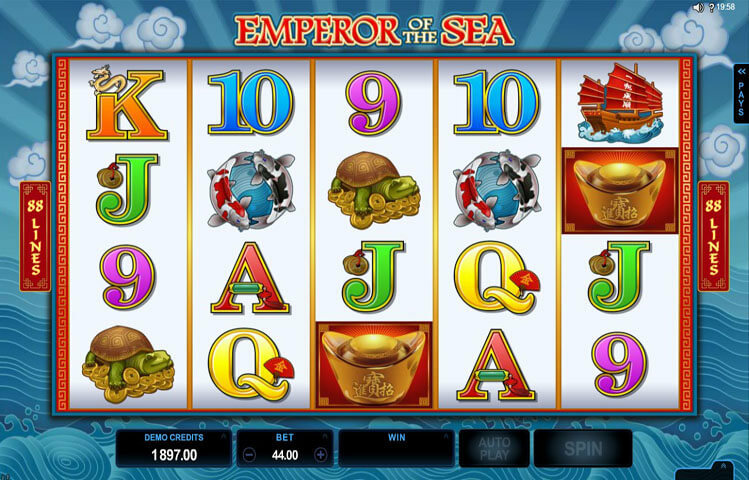 Emperor of the Sea is a brand new Microgaming powered slot machine that has a total of 5 reels with 4 rows of symbols. These reels and rows can host a different number of lines that players can choose from. These numbers are 38 lines, 68 lines and 88 lines. Each of the number of lines represents one of the fortunate and lucky numbers in the Asian culture. Therefore, players can expect to enjoy a one of a kind Asian themed experience that comes packing great visuals, sounds and plenty of winning chances for them to claim. Players will control the game play, choose the number of lines, place bets and spin the reels through the control panel that can be found underneath the reels. There is also the helpful auto play function that allows players to sit back and relax as the game spins. The game’s Asian theme is obvious to players from the moment they open the game. They will see that the game features the dragon emperor himself. The Asian game has basic level of visuals, but they are well designed to convey the theme. These cartoon styled visuals include ships, tortoise, Koi crap, coin pots and of course, the Dragon Emperor. There are also the traditional poker card icons that vary between 9s and As. There is also the logo of the game. The Emperor of the Sea logo is the game’s wild. This wild will replace all other icons on the reels of the game in order to help players create winning. This wild will replace the symbol that is going to replace the symbol that is going to trigger the biggest prize. This wild can also appear stacked during the base game or the free spins. Speaking of the free spins, players can enter that round by getting three of more of the golden ingot scatter symbol anywhere on the reels. Players will get to claim eight free spins. During the free spins, players will take advantage of the Rolling Reels and the Growing Wilds Feature.